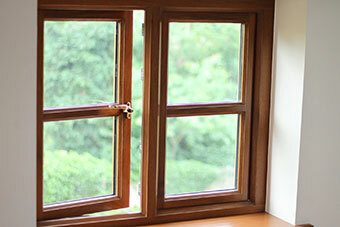 With all glazed home improvement products from High Performance Windows, we can offer a full range of glazing options. Whether you’re choosing new windows, doors, orangeries, conservatories, roof lanterns or other bespoke home improvements, we are able to offer you glazing options to suit your aesthetic and performance requirements. For instance, if you prioritise energy efficiency, we can offer double and triple glazing for excellent levels of heat retention. The energy efficiency of our windows is enhanced by the use of Warm Edge Spacer bars that improve the life span of the glazing unit by reducing the risk of cold bridging through the glass unit and thus condensation. With our timber bi-folds, conservatories and orangeries we can also fit toughened and argon-filled double glazing for greater levels of security, and also higher levels of energy efficiency due to argon’s high density and low thermal conductivity. With large-paned installations such as conservatories and orangeries, it’s important to balance privacy with the higher levels of ambient light and ventilation. To help you get the right balance for your home, High Performance Windows offer the option of tinted glass which permits lots of natural light, whilst at the same time obscuring your home’s interior from the outside. For those looking to achieve a truly authentic appearance, we are also able to supply a range of timber windows styles with decorative glazing bars to replicate period features. We can supply windows with a vast array of leaded designs, as well as Georgian and duplex bonded bars to create authentic looking windows which seamlessly integrate into a property’s traditional aesthetics. These options may be particularly useful should you live in a conservation area or period property. To give you truly personalised home improvements, High Performance Windows supply a full range of traditional and contemporary colour options. Our joinery items can be factory coated utilising our in-house spray booth facility, so no matter what your choice of colour, we can cater for all requirements. Where required we match finishes as closely as possible to your home’s existing joinery pieces. As our finishing operations are carried out in-house we eliminate the necessity of using any third party sprayers, and can guarantee a quality finish every time.